Watercolour of the Divan-i Khass in the Palace in the Delhi Fort, by Ghulam 'Ali Khan, 1817. 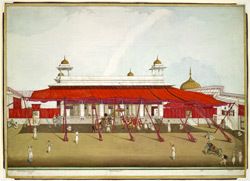 This drawing shows the red awnings and 'shamianas' fully rigged, a scene of vigorous activity beneath as a palanquin is prepared for the Emperor's departure, with various figures going about their duties. Inscribed beneath in ink in Persian: ''amal-i Ghulam 'Ali Khan musavvir fidvi-i Muhammad Akbar Shah Padshah Ghazi san 11 panjum mah-i shavval' (the work of Ghulam 'Ali Khan the painter, in the 11th year of Akbar Shah, 5th day of the month Shavval); and under the appropriate buildings from the left: ''aqb-i hamam' (back of the baths); 'naqsha-i anjuman-i Divan-i Khass dar darul khilafah Shahjahanabad' (the body of people in front of the Divan-i Khass)'; tasbih khana'(the emperor's prayer chamber on the south of the latter)'; hamam andrun-i mahall-i mubarak' (baths within the private part of the palace)'; jalau khana' (entrance hall on the extreme right)'; burj musamman' (on the golden dome). On the reverse is a faded inscription in English: 'Diwan Khass in the King's Palace ....' The Red Fort or Lal Qila, was constructed by Shah Jahan (r.1627-58) for his new city of Shahjahanabad. The Lahore gate was one of the main entrances to the fort and is composed of a central arch or 'pishtaq' with side towers. The octogonal-shaped fort complex is surrounded by high fortification walls of red sandstone which reach between 18-33 m in height. Key buildings inside the fort include the Diwan-i-Am (Hall of Public Audience), the Diwan-i-Khas (Hall of Private Audience), Moti Masjid, and the Khas Mahal (private chambers of the emperor).